I’ve just put another e-book title into Amazon for the Kindle, and into Barns and Noble for the Nook. 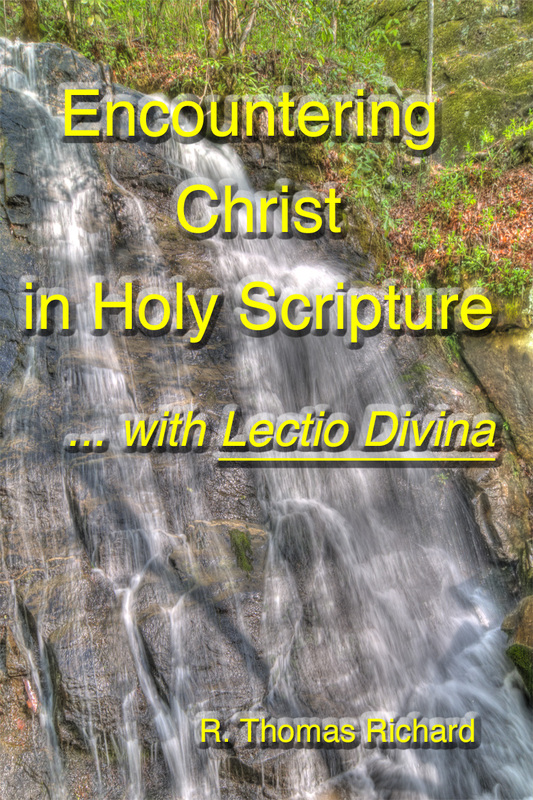 It is a small book, entitled Encountering Christ in Holy Scripture with Lectio Divina. I’ve thought for some time about doing something like this, because I believe there is a great need among Catholics for some better guidelines to help us all to learn to listen to Scripture, personally, in such a way as to hear that life-transforming word of Jesus. We Catholics need to better “become at home” in the saving word of God, so that He can better find a home within us. I finally sat down to write something in anticipation of a workshop I’m invited to give on the subject of Lectio Divina, at a diocesan conference on Hilton Head Island called, “Fire at the Beach” coming in September. •	Contemplatio – a quiet resting in contemplation with Him. •	The fifth step – Actio – is enacting the truth of the passage in one’s own life. In preparing for the workshop, I am discovering already several themes that seem to be crucially important for us in this time in our present cultural state and condition. These themes are crucially important, but scarce indeed in this culture of ours. •	(To practice Lectio) – the themes of proper reverence in the presence of The Holy in Scripture, and the stark beauty of solitude and of silence with His word. This in a culture that glorifies irreverence, group-think and noise. •	(To practice Meditatio) – the challenge of believing in objective and absolute revealed Truth, in the midst of this obsessively relativistic and skeptical age. And the challenge as well to submit to such Truth sincerely, personally, authentically. •	(To practice Oratio) – the theme of consecration – the radically faithful self-offering of personal consecration in one’s prayer to God. Even the reality, the existence of such a thing as consecration to God seems starkly out of place in this culture of independence, autonomy, emptiness and loneliness. •	(To practice Contemplatio) – the theme of communion in love with God in His word – a theme crucial to Christian life and indeed to our very humanity! – yet one that finds no place in the secular world so spiritually bankrupt in pragmatism and utilitarianism. These themes – reverence, solitude, silence, Truth, consecration, communion, love – these are essentials! Human persons were made for these precious realities, yet look how impoverished our world has become: these realities are so rare. They are denied, discarded, suppressed, rarely even acknowledged as existing! They have become as meaningless dreams or ideals, so poor is our world today. Thus the crying need for discovery – or rediscovery – of them, to rightly judge this culture so empty of them. Catholics have been given so much, and the world is in need of so much! If Catholics discover or rediscover, and embrace, what God has entrusted to us – then, perhaps, we can be the light that this darkening world needs. The darkness is growing, and so then is the need. May the Lord help us to become the help so needed, for to whom much is given, much will be required. There is much given, in the holy word of Scripture. Lectio Divina can help us find it. Thank you for writing both this blog and another e-book to help more persons encounter Christ in Holy Scripture using the method of Lectio Divina. There is so much to be gained each time we listen God’s Word, yet there are still so many who do not avail themselves of this Treasure, His Gift to us.